Carl Froch (32-2, 23 KOs) retained his WBA and IBF World Super-Middleweight titles against George Groves (19-1, 15 KOs) last night, after a epic fight that fully lived up to its billing of ’The Battle Of Britain’ and equaled the classic Eubank vs. Benn fights of the 90s for action and drama, and finally controversy. It was a fight which displayed boxing at its best, speed, skill, raw courage and durability, mixed together amid a mass of power punches that at times left the audience breathless. However, as always seems to be the way with boxing, with the good comes the bad, and then the downright ugly. The fight’s conclusion saw the fans that had spent the best part of 40 minutes on their feet cheering on both fighters, standing in an angry state of near riot, at the fight’s premature stoppage. If ever a great fight was overshadowed by a messy and murky conclusion, then unfortunately, this was one of those fights. It was not the first, and doubtless, it will not be the last, but that will be of little solace for George Groves today. In the build up this clash was marked by the tension between both boxers and Groves’ public declarations of his confidence in being able to beat Carl Froch. Many a challenger over the years has come unstuck in failing to live up to their pre-fight predictions between the ropes. Groves however, lived up to all of his talk, and walked the walk on Saturday night. Despite what the record books will say about him ’losing’. There was much talk in the build-up to this fight about Groves’ perceived lack of experience at this level, how would he react on fight night to the pressure of such a big occasion? As the fighters took their turns to enter the ring, we saw the answer. Groves looked tense, but focused. Froch by comparison, seemed to be relaxed, perhaps too relaxed. It was a marked contrast to how Froch had been in the run up to the fight, tense and angry at his challenger’s remarks and ’arrogance’. Earlier, pre-fight footage of Froch in his dressing room had shown him laughing and joking, and chatting to David Haye. 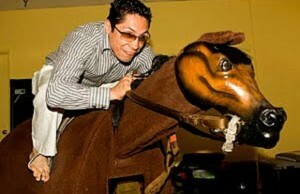 This was not the ultra-focused behaviour that we saw from ’The Cobra’ prior to his last outing against Mikkel Kessler. When both men were in the ring waiting instructions, Groves stood in mid-ring, staring unblinkingly at the champion; it was the kind of look a prime Roberto Duran once inflicted upon his opponents. If Froch had expected to see Groves blinking in nervousness at this point, then he must have been at least a little surprised, and perhaps even shocked. At the bell for the 1st, both men moved out to the centre of the ring and exchanged preliminary jabs. Groves, known for his technical ability and footwork, was not attempting to use the ring and keep the champion at a distance; instead, he was standing his ground and coming at Froch. The champion, meanwhile, seemed slightly wrong-footed by his challenger’s early aggression, and the fast Groves’ jab, which was already beating his own left hand. Groves showed excellent reflexes, as he crouched slightly forward, his chin tucked into his chest, and slipped the majority of Froch’s jabs with neat head movement. Froch on the other hand, was being tagged cleanly by the challenger’s jab, and was already being made to reach awkwardly, in an effort to pin a shot onto his elusive opponent. After just two minutes, the champion’s nose was already showing signs of blood, and there was more to come. 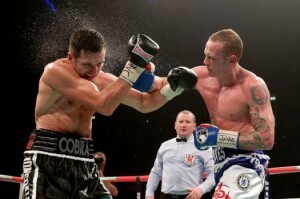 As the round entered its latter stages, Groves was trying to follow up on his jab with his right hand. The same right hand, which so many had doubted could hurt the iron-chinned champion. With just twenty seconds of the round left, Groves exploded a long, fast right, squarely upon Froch’s rock-like jaw, and the champion was down on his back, hard. Although ’The Cobra’ regained his feet quickly, his legs betrayed the hurt he had suffered, and his eyes were glassy. Groves landed two more good right hands before the bell rang. Froch took a wobbly walk back to his corner. The 2nd round saw Groves growing in confidence by the second, as the crowd roared, and cheered, with a mixture of excitement and disbelief. Groves was firing and landing his jab almost at will now, and following it with right hands, while Froch still seemed a little stiff-legged from the knockdown in the first, and had been reduced to simply pawing with his own jab. Groves’ extra speed was proving a key factor, and his dangerous right hand was finding Froch again and again. Froch’s low-held left hand was proving to be his Achilles heel against Groves, just as it had been against Andre Ward. 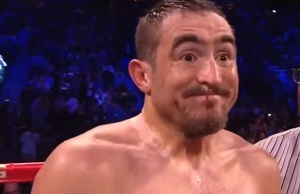 To Froch’s credit, he took some right hands in this round, and indeed most of the rounds following it, that would have had most other fighters down again, probably for the full count. Froch is as tough and gutsy, as just about any fighter we have produced in this country. Also impressive in this round was Groves’ coolness with his injured prey in front of him. He showed poise and control at this point, which belied his youth and inexperience, keeping control of the fight, but not rushing in, and taking unnecessary chances. The third round followed much the same pattern as the second, with Groves dominating with his jab, and jarring Froch with right hands. Froch was tentative to let go with his own punches because of the counters, which were coming back at him. Groves’ aggressive boxing and ring-generalship were a pleasure to behold. Every once in a while, a boxer with already noted talent moves up in class, and produces a performance which surpasses everything he has been capable of before. The fight’s spectators, perhaps already realized, that they were watching something very special on this night. In the fourth round, Froch took more of the same, as Groves used his reflexes and movement to slip what shots the champion was getting off, and replied with jabs and two, and three right hands at a time. Froch, who has never been known for his footwork, was at times being made to look clumsy, and downright slow, by the nimble and quick-footed challenger. There was an added urgency to Froch’s work in the 5th, as he began forcing himself forward more, perhaps realising that he was being simply picked off at a distance. However, while he landed some shots of his own, Groves replied with counters, which seemed to do more damage, and stop Froch in his tracks at times. Again, the champion just seemed unable to deal with his challenger’s superior speed and perhaps most surprisingly, Groves’ punches were having more effect on Froch, than Froch’s were having on him. The 6th round was one of epic proportions in terms of actions, excitement, and violence metered out by each man. Froch was marauding forward now, and trying to unleash his awkward looking, but usually effective, two-handed attacks at Groves. Trying to force his way inside the challenger’s tormenting jabs and right hands. Groves replied to Froch’s attacks with some brutal shots of his own, which again, edged the champion’s punches, for not just speed and accuracy, but also venom. Near the end of the round, Groves seemed to lose his focus for the first time in the fight and allowed himself to be maneuvered onto the ropes, where he lowered his hands, and taunted Froch to come at him. In the ensuring exchange, punches were swapped each way, as Froch let loose with both fists, and Groves replied with his own shots. It was the first sign that perhaps the challenger’s impetuous youth could be his undoing. In the 7th, Groves was back to using his jab and beating Froch to the punch again and again, but every now and then Froch landed something of his own, as he simply walked through some terrific counters from Groves. While the challenger was still winning the rounds, it was becoming more a question of endurance. Could Groves continue to fight at such a level and pace, and could Froch continue to endure the left and right hand bombs that kept coming his way from his challenger? By the 8th round, Froch found more success, as Groves neglected his jab, and seemed content to slug it out with the champion. Faced with the kind of fight in which he thrives, Froch was looking to rough up the challenger with wicked punches on the inside, mixed in with shoulders, and forearms. Groves, however, seemed to be relishing the brutality, and was still landing plenty of punches of his own. By electing to go toe-to-toe with the champion, Groves was giving up the advantages of speed and technique, which had gained him the upper hand through most of the previous rounds. As the action became rougher and rougher, from both sides, the warnings from referee Howard Foster were becoming more frequent. At times, it seemed he was struggling to control the fighters and cope with their physicality. Groves closed the 8th round by going back to his jab and the difference was clear immediately. When using his jab, Groves’ superiority over Froch was palpable. The 9th round continued where the eighth left off, with both men swapping heavy shots, and again, Groves happy to go toe-to-toe with the champion. Both men seemed intent on knocking the other man out, for Froch this seemed to be a necessity, in order to retain his title, so far did he seem to be behind on points, for Groves it was a matter of macho ego. Honours in this round were even to start with, as both fighters bounced swinging haymakers off the other, but then, a Froch right hand visibly shook up Groves, who held on. Froch followed up with some punches to the back of the head and a forearm. Groves seeking to regroup, moved back, pursued by the champion, who drove him onto the ropes with a two- handed barrage, some of which missed, others that landed glancingly. At this point, Groves flailed away with both hands to fight his way off the ropes, but as he did so, Referee Howard Foster grabbed hold of Groves by the waist, and then waived the fight over, much to the shock and disbelief of Groves and the crowd. There is no doubt that Groves was hurt at this point in the fight. His legs looked wobbly and he had lost his coordination, but this was a world title fight and Groves had been in control for much of it. In addition, Froch had taken a huge amount of punishment through much of the contest and had been dropped in the first, and visibly shook by Groves punches in just about every round after that. For Groves to be stopped at such a point in the fight, was really quite ludicrous. Grove’s immediate reaction at the referee’s action showed clearly that the challenger was in charge of all his faculties. In the immediate aftermath of the fight, the sense of injustice was overwhelming throughout the arena. It also has to be said that Froch was favoured throughout the contest by the referee, who allowed the desperate champion to get away with some very dirty tactics, including hitting on the break, rabbit punches, and forearms. None of which, to his credit, Groves complained about, either during or after the fight. Foster’s whole manner in the course of the fight was that of someone struggling to contain it and control the fighters. Perhaps, just as worrying, as the premature stoppage itself, is the fact that at this point in the fight, Froch was only one point down on two of the cards! Despite the knockdown in the first round, which would have given Groves a two point round. With this in mind, if this match had gone the distance, there is no guarantee that Groves would have got the decision, despite his seeming dominance through most of the fight. Few would dispute that Groves was winning this fight handily, easily even, up until he elected to slug it out, and then he was still holding his own, until a brief moment in the 9th, at which point the referee took it upon himself to end the fight. Keeping in mind the judging fiasco of the Raymond Beltran vs. Ricky Burns World lightweight title fight of a few months ago, where Beltran was held to a draw despite seemingly dominating Burns all night, it does seem that Matchroom’s world champions are rather hard to beat on points, no matter what occurs within the ring. Of course, thanks to the efforts of Mr. Foster, this fight didn’t need to go to the scorecards. There will be an argument from some that a fight is better stopped too early than too late, however, this is also a convenient argument behind which to hide injustice. 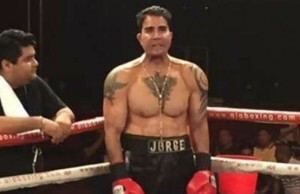 Boxing is a very hard life for those involved and so to see a man robbed of the chance to achieve the pinnacle of his career, after many years of hard work, is a bitter pill to swallow. Groves is young and has hopefully many years and many fights ahead of him, but he should not have been robbed of his chance to achieve last night, what he will now have to try and achieve in the future. If he is given the opportunity. As the smoke clears and the arguments go on, we are left with a battered and bruised champion in Carl Froch, who did not deserve the boos which he heard at the end of last night. It is worth remembering that while Groves was robbed of possible victory and was the victim of some harsh scoring by the judges, Froch was also denied a chance to score a conclusive victory over Groves, one that would have been ranked amongst the best come from behind performances of his career. Instead, Froch walks away still with his belts , but also the whiff of controversy, and perhaps mulling over the fickleness of fame and popularity, and how one hour in boxing can transform cheers to boos and boos to cheers. George Groves entered the ring on Saturday night to the loud boos of about 20,000 people. 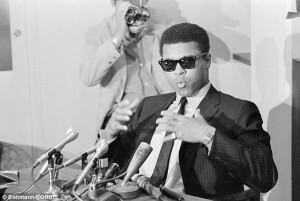 One hour later, he exited the ring a loser for the first time in his career, but now to the cheers of 20,000 people. Putting the various controversies aside, the challenger showed on this night, that he is not only a world-class fighter, but an extremely good world-class fighter, who can hopefully learn from this bittersweet experience, and come back even better. A rematch between these two warriors looks like being a guaranteed classic and it is hard to imagine the proud Froch not wanting the chance to put the controversies of this fight straight in a second match with Groves. Get ready for Battle of Britain 2!